"Proust" redirects here. For other uses, see Proust (disambiguation). Valentin Louis Georges Eugène Marcel Proust (/pruːst/; French: [maʁsɛl pʁust]; 10 July 1871 – 18 November 1922), known as Marcel Proust, was a French novelist, critic, and essayist best known for his monumental novel À la recherche du temps perdu (In Search of Lost Time; earlier rendered as Remembrance of Things Past), published in seven parts between 1913 and 1927. He is considered by critics and writers to be one of the most influential authors of the 20th century. Proust was born in the Paris Borough of Auteuil (the south-western sector of the then-rustic 16th arrondissement) at the home of his great-uncle on 10 July 1871, two months after the Treaty of Frankfurt formally ended the Franco-Prussian War. He was born during the violence that surrounded the suppression of the Paris Commune, and his childhood corresponded with the consolidation of the French Third Republic. Much of In Search of Lost Time concerns the vast changes, most particularly the decline of the aristocracy and the rise of the middle classes, that occurred in France during the Third Republic and the fin de siècle. Proust's father, Adrien Proust, was a prominent pathologist and epidemiologist, studying cholera in Europe and Asia. He wrote numerous articles and books on medicine and hygiene. Proust's mother, Jeanne Clémence (Weil), was the daughter of a wealthy Jewish family from Alsace. Literate and well-read, she demonstrated a well-developed sense of humour in her letters, and her command of English was sufficient to help with her son's translations of John Ruskin. Proust was raised in his father's Catholic faith. He was baptized (on 5 August 1871, at the church of Saint-Louis d'Antin) and later confirmed as a Catholic, but he never formally practiced that faith. He later became an atheist and was something of a mystic. In 1882, at the age of eleven, Proust became a pupil at the Lycée Condorcet, but his education was disrupted by his illness. Despite this he excelled in literature, receiving an award in his final year. Thanks to his classmates, he was able to gain access to some of the salons of the upper bourgeoisie, providing him with copious material for In Search of Lost Time. Despite his poor health, Proust served a year (1889–90) in the French army, stationed at Coligny Barracks in Orléans, an experience that provided a lengthy episode in The Guermantes' Way, part three of his novel. As a young man, Proust was a dilettante and a social climber whose aspirations as a writer were hampered by his lack of self-discipline. His reputation from this period, as a snob and an amateur, contributed to his later troubles with getting Swann's Way, the first part of his large-scale novel, published in 1913. At this time, he attended the salons of Mme Straus, widow of Georges Bizet and mother of Proust's childhood friend Jacques Bizet, of Madeleine Lemaire and of Mme Arman de Caillavet, one of the models for Madame Verdurin, and mother of his friend Gaston Arman de Caillavet, with whose fiancée (Jeanne Pouquet) he was in love. It is through Mme Arman de Caillavet, he made the acquaintance of Anatole France, her lover. Proust had a close relationship with his mother. To appease his father, who insisted that he pursue a career, Proust obtained a volunteer position at Bibliothèque Mazarine in the summer of 1896. After exerting considerable effort, he obtained a sick leave that extended for several years until he was considered to have resigned. He never worked at his job, and he did not move from his parents' apartment until after both were dead. His life and family circle changed markedly between 1900 and 1905. In February 1903, Proust's brother, Robert Proust, married and left the family home. His father died in November of the same year. Finally, and most crushingly, Proust's beloved mother died in September 1905. She left him a considerable inheritance. His health throughout this period continued to deteriorate. Proust spent the last three years of his life mostly confined to his bedroom, sleeping during the day and working at night to complete his novel. He died of pneumonia and a pulmonary abscess in 1922. He was buried in the Père Lachaise Cemetery in Paris. Proust was involved in writing and publishing from an early age. In addition to the literary magazines with which he was associated, and in which he published while at school (La Revue verte and La Revue lilas), from 1890 to 1891 he published a regular society column in the journal Le Mensuel. In 1892, he was involved in founding a literary review called Le Banquet (also the French title of Plato's Symposium), and throughout the next several years Proust published small pieces regularly in this journal and in the prestigious La Revue Blanche. In 1896 Les plaisirs et les jours, a compendium of many of these early pieces, was published. The book included a foreword by Anatole France, drawings by Mme Lemaire in whose salon Proust was a frequent guest, and who inspired Proust's Mme Verdurin. She invited him and Reynaldo Hahn to her château de Réveillon (the model for Mme Verdurin's La Raspelière) in summer 1894, and for three weeks in 1895. This book was so sumptuously produced that it cost twice the normal price of a book its size. That year Proust also began working on a novel, which was eventually published in 1952 and titled Jean Santeuil by his posthumous editors. Many of the themes later developed in In Search of Lost Time find their first articulation in this unfinished work, including the enigma of memory and the necessity of reflection; several sections of In Search of Lost Time can be read in the first draft in Jean Santeuil. The portrait of the parents in Jean Santeuil is quite harsh, in marked contrast to the adoration with which the parents are painted in Proust's masterpiece. Following the poor reception of Les Plaisirs et les Jours, and internal troubles with resolving the plot, Proust gradually abandoned Jean Santeuil in 1897 and stopped work on it entirely by 1899. Beginning in 1895 Proust spent several years reading Carlyle, Emerson, and John Ruskin. Through this reading he refined his theories of art and the role of the artist in society. Also, in Time Regained Proust's universal protagonist recalls having translated Ruskin's Sesame and Lilies. The artist's responsibility is to confront the appearance of nature, deduce its essence and retell or explain that essence in the work of art. Ruskin's view of artistic production was central to this conception, and Ruskin's work was so important to Proust that he claimed to know "by heart" several of Ruskin's books, including The Seven Lamps of Architecture, The Bible of Amiens, and Praeterita. Proust set out to translate two of Ruskin's works into French, but was hampered by an imperfect command of English. To compensate for this he made his translations a group affair: sketched out by his mother, the drafts were first revised by Proust, then by Marie Nordlinger, the English cousin of his friend and sometime lover Reynaldo Hahn, then finally polished by Proust. Questioned about his method by an editor, Proust responded, "I don't claim to know English; I claim to know Ruskin". The Bible of Amiens, with Proust's extended introduction, was published in French in 1904. Both the translation and the introduction were well-reviewed; Henri Bergson called Proust's introduction "an important contribution to the psychology of Ruskin", and had similar praise for the translation. At the time of this publication, Proust was already translating Ruskin's Sesame and Lilies, which he completed in June 1905, just before his mother's death, and published in 1906. Literary historians and critics have ascertained that, apart from Ruskin, Proust's chief literary influences included Saint-Simon, Montaigne, Stendhal, Flaubert, George Eliot, Fyodor Dostoyevsky, and Leo Tolstoy. 1908 was an important year for Proust's development as a writer. During the first part of the year he published in various journals pastiches of other writers. These exercises in imitation may have allowed Proust to solidify his own style. In addition, in the spring and summer of the year Proust began work on several different fragments of writing that would later coalesce under the working title of Contre Sainte-Beuve. Proust described his efforts in a letter to a friend: "I have in progress: a study on the nobility, a Parisian novel, an essay on Sainte-Beuve and Flaubert, an essay on women, an essay on pederasty (not easy to publish), a study on stained-glass windows, a study on tombstones, a study on the novel". From these disparate fragments Proust began to shape a novel on which he worked continually during this period. The rough outline of the work centered on a first-person narrator, unable to sleep, who during the night remembers waiting as a child for his mother to come to him in the morning. The novel was to have ended with a critical examination of Sainte-Beuve and a refutation of his theory that biography was the most important tool for understanding an artist's work. Present in the unfinished manuscript notebooks are many elements that correspond to parts of the Recherche, in particular, to the "Combray" and "Swann in Love" sections of Volume 1, and to the final section of Volume 7. Trouble with finding a publisher, as well as a gradually changing conception of his novel, led Proust to shift work to a substantially different project that still contained many of the same themes and elements. By 1910 he was at work on À la recherche du temps perdu. Begun in 1909, when Proust was 38 years old, À la recherche du temps perdu consists of seven volumes totaling around 3,200 pages (about 4,300 in The Modern Library's translation) and featuring more than 2,000 characters. Graham Greene called Proust the "greatest novelist of the 20th century", and W. Somerset Maugham called the novel the "greatest fiction to date". André Gide was initially not so taken with his work. The first volume was refused by the publisher Gallimard on Gide's advice. He later wrote to Proust apologizing for his part in the refusal and calling it one of the most serious mistakes of his life. 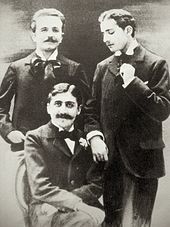 Proust died before he was able to complete his revision of the drafts and proofs of the final volumes, the last three of which were published posthumously and edited by his brother Robert. The book was translated into English by C. K. Scott Moncrieff, appearing under the title Remembrance of Things Past between 1922 and 1931. Scott Moncrieff translated volumes one through six of the seven volumes, dying before completing the last. This last volume was rendered by other translators at different times. When Scott Moncrieff's translation was later revised (first by Terence Kilmartin, then by D. J. Enright) the title of the novel was changed to the more literal In Search of Lost Time. In 1995 Penguin undertook a fresh translation of the book by editor Christopher Prendergast and seven translators in three countries, based on the latest, most complete and authoritative French text. Its six volumes, comprising Proust's seven, were published in Britain under the Allen Lane imprint in 2002. Proust is known to have been a homosexual, and his sexuality and relationships with men are often discussed by his biographers. Although his housekeeper, Céleste Albaret, denies this aspect of Proust's sexuality in her memoirs, her denial runs contrary to the statements of many of Proust's friends and contemporaries, including his fellow writer André Gide as well as his valet Ernest A. Forssgren. Proust never openly admitted to his homosexuality, though his family and close friends either knew or suspected it. In 1897, he even fought a duel with writer Jean Lorrain, who publicly questioned the nature of Proust's relationship with Lucien Daudet (both duelists survived). Despite Proust's own public denial, his romantic relationship with composer Reynaldo Hahn, and his infatuation with his chauffeur and secretary, Alfred Agostinelli, are well documented. On the night of 11 January 1918, Proust was one of the men identified by police in a raid on a male brothel run by Albert Le Cuziat. Proust's friend, the poet Paul Morand, openly teased Proust about his visits to male prostitutes. In his journal, Morand refers to Proust, as well as Gide, as “constantly hunting, never satiated by their adventures … eternal prowlers, tireless sexual adventurers." The exact influence of Proust's sexuality on his writing is a topic of debate. However, In Search of Lost Time discusses homosexuality at length and features several principal characters, both men and women, who are either homosexual or bisexual: the Baron de Charlus, Robert de Saint-Loup, and Albertine Simonet. Homosexuality also appears as a theme in Les plaisirs et les jours and his unfinished novel, Jean Santeuil. Proust inherited much of his mother's political outlook, which was supportive of the French Third Republic and near the liberal center of French politics. In an 1892 article published in Le Banquet entitled "L'Irréligion d'État", Proust condemned extreme anti-clerical measures such as the expulsion of monks, observing that "one might just be surprised that the negation of religion should bring in its wake the same fanaticism, intolerance, and persecution as religion itself." He argued that socialism posed a greater threat to society than the Church. Reflecting on the subject again in 1904, in the article "La mort des cathédrales", Proust wrote that his fears over the fate of the French culture had subsided as anti-clerical deputies allied with the clergy when faced with German aggression. Proust always rejected the bigoted and illiberal views harbored by many priests at the time, but believed that the most enlightened clerics could be just as progressive as the most enlightened secularists, and that both could serve the cause of "the advanced liberal Republic." Proust was among the earliest Dreyfusards, even attending Émile Zola's trial and proudly claiming to have been the one who asked Anatole France to sign the petition in support of Dreyfus's innocence. In 1919, when representatives of the right-wing Action Française published a manifesto upholding French colonialism and the Catholic Church as the embodiment of civilized values, Proust rejected their nationalism and chauvinism in favor of a liberal pluralist vision which acknowledged Christianity's cultural legacy in France. Julien Benda commended Proust in La Trahison des clercs as a writer who distinguished himself from his generation by avoiding the twin traps of nationalism and class sectarianism. ^ "Proust". Random House Webster's Unabridged Dictionary. ^ Harold Bloom, Genius, pp. 191–225. ^ "Marcel Proust". New York Times. Retrieved 13 October 2016. ^ Allan Massie – Madame Proust: A Biography By Evelyne Bloch-Dano, translated by Alice Kaplan Archived 12 February 2009 at the Wayback Machine – Literary Review. ^ a b c d e f g Tadié, J-Y. (Euan Cameron, trans.) Marcel Proust: A life. New York: Penguin Putnam, 2000. ^ Edmund White (2009). Marcel Proust: A Life. Penguin. ISBN 9780143114987. "Marcel Proust was the son of a Christian father and a Jewish mother. He himself was baptized (on August 5, 1871, at the church of Saint-Louis d'Antin) and later confirmed as a Catholic, but he never practiced that faith and as an adult could best be described as a mystical atheist, someone imbued with spirituality who nonetheless did not believe in a personal God, much less in a savior." ^ Proust, Marcel (1999). The Oxford dictionary of quotations. Oxford University Press. p. 594. ISBN 978-0-19-860173-9. "...the highest praise of God consists in the denial of him by the atheist who finds creation so perfect that it can dispense with a creator." ^ Marcel Proust: Revolt against the Tyranny of Time. Harry Slochower .The Sewanee Review, 1943. ^ Wilson, Scott. Resting Places: The Burial Sites of More Than 14,000 Famous Persons, 3d ed. : 2 (Kindle Locations 38123-38124). McFarland & Company, Inc., Publishers. Kindle Edition. ^ White, Edmund (1999). Marcel Proust, a life. Penguin. p. 2. ISBN 9780143114987. ^ Hall, Sean Charles (12 February 2012). "Dueling Dandies: How Men Of Style Displayed a Blasé Demeanor In the Face of Death". Dandyism. ^ Whitaker, Rick (1 June 2000). "Proust's dearest pleasures: The best of a slew of recent biographies points to the author's conscious self-closeting". Salon. ^ a b c d e f Hughes, Edward J. (2011). Proust, Class, and Nation. Oxford University Press. pp. 19–46. ^ Carter, William C. (2013). Marcel Proust: A Life, with a New Preface by the Author. Yale University Press. p. 346. ^ Sprinker, Michael (1998). History and Ideology in Proust: A la Recherche Du Temps Perdu and the Third French Republic. Verso. pp. 45–46. ^ Bales, Richard (2001). The Cambridge Companion to Proust. Cambridge University Press. p. 21. Adorno, Theodor, "Short Commentaries on Proust," Notes to Literature, trans. S. Weber-Nicholsen (New York: Columbia University Press, 1991). Benjamin, Walter, "The Image of Proust," Illuminations, trans. Harry Zohn (New York: Schocken Books, 1969); pp. 201–215. Gracq, Julien, "Proust Considered as An End Point," in Reading Writing (New York: Turtle Point Press,), 113–130. Hillerin, Laure La comtesse Greffulhe, L'ombre des Guermantes, Paris, Flammarion, 2014. Part V, La Chambre Noire des Guermantes. About Marcel Proust and comtesse Greffulhe's relationship, and the key role she played in the genesis of La Recherche. Spitzer, Leo, "Proust's Style,"  in Essays in Stylistics (Princeton, Princeton U. P., 1948). BBC audio file. In Our TIme discussion, Radio 4. The Kolb-Proust Archive for Research. University of Illinois. The Album of Marcel Proust, Marcel Proust receives a tribute in this album of "recomposed photographs". "Swann's Way Exhibited at The Morgan Library". The New York Times. "Why Proust? And Why Now?". The New York Times. 13 April 2000. - Essay on the lasting relevance of Proust and his work. This page was last edited on 3 April 2019, at 11:56 (UTC).